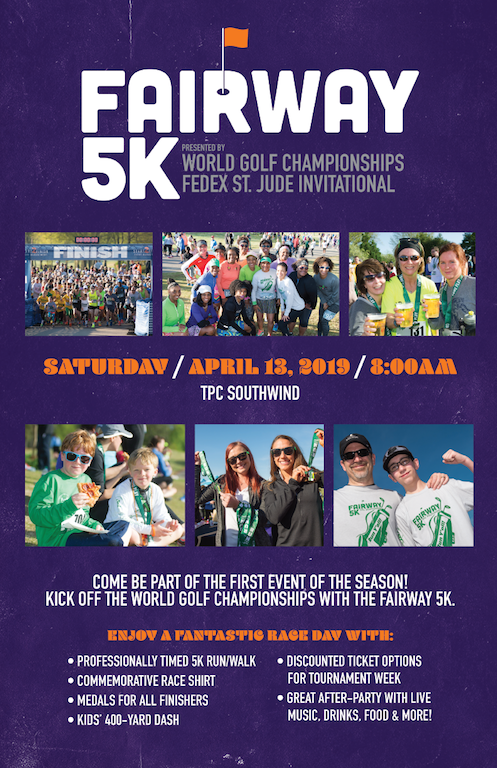 Join us for the 7th Annual Fairway 5K presented by the World Golf Championships-FedEx St. Jude Invitational! Back by popular demand, this can’t-miss Spring event features a unique route set against the beautiful backdrop of TPC Southwind. Afterwards, hang out on the practice range at one of the best post-race parties in the city, featuring live music, Michelob Ultra, Bloody Mary’s, Mimosas, food and more! All runners will receive a race shirt and custom-designed medal with the top three finishers in each age group receiving an additional award. Want to attend the WGC-FedEx St. Jude Invitational in July? Select the bundle option at race registration and reserve a practice round ticket for Wednesday, July 24. In addition to this opportunity, all registered participants will receive a special discounted ticket offer to the WGC-FedEx St. Jude Invitational (kids 18 & under can attend the tournament for free with a ticketed adult). We look forward to seeing you on the course for the Fairway 5K in April and the WGC-FedEx St. Jude Invitational in July!